This mic can be seen in Nicky Romero's studio in a tweet. The specific use was to record voiceovers in his Protocol Radio show. He is using this mic to record sound from his guitar. "All of the OceanLab tracks to date (including satellite) were recorded using a rode NT1, but we've now got a Neumann U87." A fan Tweets to Madeon, "I'm getting a budget microphone this Christmas, vocal melody plans have been stuck in my head ever since I considered it!" Madeon replies, "you can find a rode nt1a with a full pack for pretty cheap nowadays, and that's the mic i've been recording with" (Tweet from 27 Oct 2015). B.B. King uses a Rode NT1-A Condenser Microphone as announced. In this email from Mat Zo from February 2017 detailing his studio gear, he reveals that the microphone he uses is the Rode NT1-A Condenser Mic. In This video around the 3:21 mark Future can be seen recording into a Rode condenser microphone. "Comparing the Rode NT1-A with a U87, the difference of $3000 is tiny. The Rode even has less self noise." In this photo, Danyew's Rode NT1-A condenser microphone is visible. 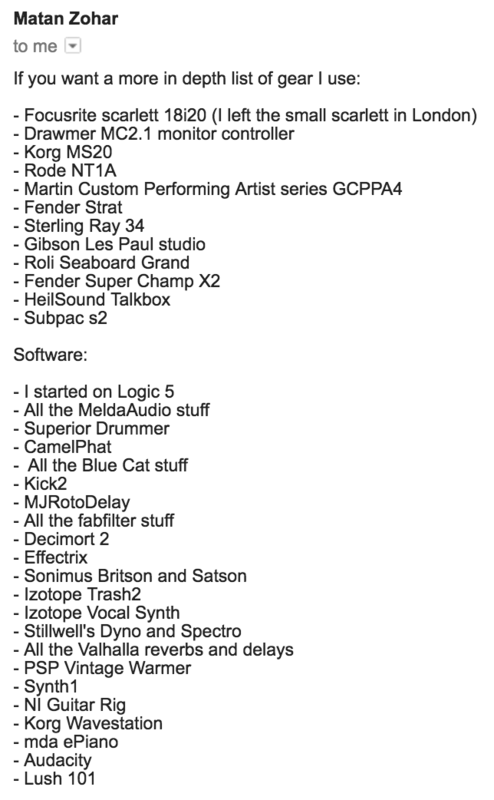 In the FAQ section of his Facebook biography, RamesesB mentions using a Rode NT1-A microphone for his vocal recordings. Rob posted this image to his Facebook profile. Shown on the left of this picture. In this Instagram photo from his account he has said, "I wanted to buy a microphone & my dealer left me these..."
In this performance, Julia is singing to a Rode NT1-A Condenser Microphone. Love it's sound, it's pretty transparent. Kieran is using a Rode NT1-A throughout this video. In this video William Singe uses this microphone in a cover of One Dance by Drake. In this insta pic Orla's RODE NT1A on a SM6 mount can be seen next to her Washburn Guitar. Can be seen in front of the Guitar amp. This mic can be seen in all of his youtube videos, as well as some instagram posts. Best one in the market,clean sounding vocals. What can be said about this state of the art Condenser Mic which hasn't already by the probably hundred reviews and counting. Stunning clarity and accuracy, beautiful microphone. Amazing microphone. Great for recording. This microphone is great for recording anything. I highly suggest it. Also great for live performances, too. Very basic mic, but it delivers! People are always amazed by the very clear results it gives. Highly recommend this one for any user, beginner or pro. RODE NT1A won numerous prizes and #1's for its low noise floor, good sound and availability. I've got a pair of these I use for ambience and all the rest - vocals, woodwinds, acoustic guitar etc. It's a very good sounding condenser microphone, really warm and musical. The designers aimed for the cheapest design so it has only a cardioid pattern and no pads, but I don't miss that since it just delivers with what it's got. I've seen NT1A's in many studios I've been to and sometimes sound engineers preferred them to 414's, TLM's and other expensive and vintage mics for certain applications. A well-respected general purpose professional condenser microphone that costs way less than it should have been. The highs are a little too pronounced, and it's not as full and lush as a truly great mic, but for just over $200, it is tough to beat. It picks up everything for fairly long distances, so you want to treat your room heavily, and put up baffles and shielding or an isolation booth or something to stop everything you don't want in your recording from ending up in the track. On it's own, it sounds a little thin, but with a good preamp it shows its full potential. A Tube preamp can help warm up the inherent coldness. If you have the right room or sound treatment, a good vocalist or MC, a half decent pre, good levels and a good recording engineer, this is a workhorse that can do more than you might think. It's pretty much exclusively a vocal mic, though it could do drum overheads if you had 2 of them, or a distant drum room mic for fill. It's a cheap knock off on a U87 but if you are comparing it to that, there's little comparison other than the shape. If you are used to a cheap mic though, this one will feel like a nice upgrade. The mic is decent for home studio. I guess the problems I am having from time to time are rather related to my incompetence when it comes to recording in general. even an sm57 can sound amazing if you position it just right. Pretend you don't have EQ available when you are trying to get a sound into the recorder. You will spend more time capturing it right if you imagine that you can't fix it in the mix. One of my prefered mics, it's not very expensive and offers really good quality sound. Huge upgrade from the Blue Snowball I now use as a desk mic for voice chatting. Nothing much to say about this mic, everything comes through crisp and clean. Would recommend for sure. Sounds great on male vocals, at a ridiculously low price. Amazing sound in this price bracket, lots of high end, can be more suited to male vocals, but generally really great on acoustic guitars and percussion. Can't really go wrong at this price, next step would be a Neumann u87 or Blue microphone. Great mic for acustic guitars and vocals, sometimes can be too shinny but nothing you can fix with proper eq. Just Tap The Record Button !!! With this Mic You don't need any another mic for Recording !!! Im very Happy With this !!! Just used it on my new vocal track and it sounds amazing!!!! It's a pretty great microphone. I haven't used it much yet but for the little while that I've used it, it's sounded great. Still working on getting a microphone stand, so I can't really say much about it in detail. Love mine so much....I bought two. A VERY versatile mic. Used this for female vocals and gritty rap and they both sounded great. This mic will get you the sound you desire. The pop filter included could be better but overall the mic is a great leap into getting serious with your music. Leaps above any USB mic that is offered. Great mic to start recording vocals on, works ideally for what I need. Insane microphone for this price. Combined with the awesome UAD Appolo twin, this beauty records professionals vocals.